Extreme space weather storms are driven by solar activity, which originates at sunspots. These storms influence the Earth in many ways, and present particular hazards to our modern technology-dependent society. The link between solar activity and climate is also a hot topic. The average number of sunspots on the Sun varies with a semi-regular 11-year cycle known as the solar cycle. Short-term variations (daily, weekly and monthly) occur as sunspot groups form, evolve and decay, and as spots rotate on and off the solar disk. There are also longer-term variations occurring over timescales from years to centuries. Figure 1 shows the yearly sunspot numbers constructed from observations dating back to the introduction of the telescope in the early 1600s. The cycle is the most obvious feature of the graph, although there is also a substantial variation in the amplitude of the cycles (the height of the peaks); other variations are also apparent. The sunspot number was close to zero from 1645 to 1715 due to the Maunder minimum. This is a real phenomenon and not a consequence of a lack of observations. The sunspot cycle was identified by amateur astronomer Samuel Heinrich Schwabe in 1843 based on personal observation of two cycles of maxima and minima. The late discovery of the cycle may be attributed in part to the cycle length, which is a significant fraction of a human lifetime. It required a dogmatic observer to watch for long enough, and to see past the noise. Sunspots represent locations on the Sun’s visible surface, the photosphere, where intense magnetic fields (with field strengths up to 3000 gauss, or 0.3 tesla) emerge into the overlying atmosphere, the corona. The magnetic field acts locally to inhibit the motion of the gas or fluid beneath the surface that is responsible for the flow of energy to the photosphere. As a result the spots are cooler, and darker, than the surrounding photosphere. The magnetic fields are generated inside the Sun by a “solar dynamo” driven by solar rotation and convection, but the dynamo mechanism remains incompletely understood. There is no detailed theory accounting for the origin of the magnetic field and the appearance of the 11-year cycle. In recent decades the field of helioseismology has provided maps of large-scale fluid motion inside the Sun, and the new data is helping to develop and improve dynamo theories. In addition to the intense localised fields of sunspots, the Sun also has a much weaker background magnetic field. This is strongest near the poles (a few gauss, or of magnitude 10–4 tesla) and predominantly of one sign at the north pole and predominantly the opposite sign at the south pole. The particular polarity (sign) at a given pole changes with each solar cycle, with the reversal occurring around the time of maximum. At the time of writing (early January 2014) we are close to the maximum of the current cycle, and the reversal is occurring. A given pole returns to the same polarity every 22 years, which shows that the underlying magnetic cycle has a 22-year periodicity. The level of solar activity on the Sun, including the numbers of flares and coronal mass ejections (see box), varies with the 11-year sunspot cycle because the flares and coronal mass ejections are produced by sunspots. The solar maximum (the peak of the sunspot cycle) results in many more large flares and energetic coronal mass ejections than there are at the solar minimum. Figure 2 shows a plot of monthly sunspot numbers from January 2000 to November 2013, and illustrates the most recent period of solar minimum. 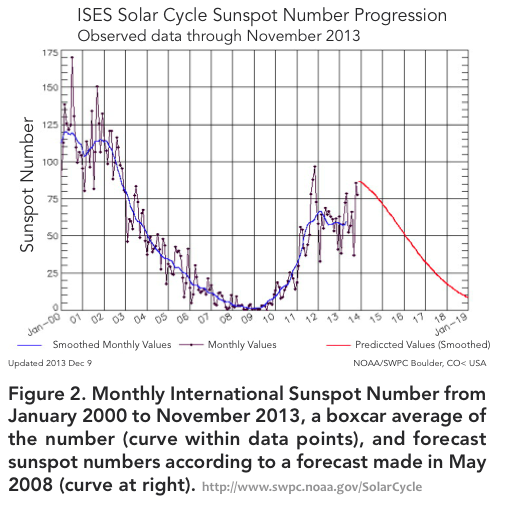 Recent solar cycles are numbered, and the current cycle is labelled cycle 24. The minimum between cycles 23 and 24 surprised solar astronomers in that it was longer and deeper than expected, with correspondingly very low levels of solar activity. The year 2008 was the most spot-free on the Sun since 1913. Correspondingly, there were no X-class flares on the Sun between December 2006 and February 2011. Sunspot numbers increased slowly through 2010 and 2011, and we are now witnessing a small but definite period of maximum. Initial forecasts of the size of the cycle proved to be too large, and in May 2008 a reduced forecast was issued by the US National Oceanic and Atmospheric Association. This proved to be an overestimate, as shown in Figure 2. Flares and coronal mass ejections, and solar activity, would be of purely academic interest except for the phenomenon of space weather. This describes conditions in our local space environment, and severe conditions include storms of solar energetic particles that produce enhanced auroral displays. These events can damage satellite electronics, pose radiation risks for astronauts and raise background radiation levels for crew on polar airline flights. The particles are accelerated during flares and also at large shockwaves driven by coronal mass ejections. At ground level we are shielded from most of the danger by the atmosphere and the Earth’s magnetic field. However, variations in the local magnetic field surrounding the Earth (the magnetosphere) produced by coronal mass ejections impacting the magnetosphere induce currents in the conducting space plasma, as well as currents in electricity grids on the surface of the Earth. In 1989 a magnetic storm produced by a large flare and coronal mass ejection shut down Hydro-Quebec, the grid providing power to Canada’s Quebec province. The first solar flare was observed by Richard Carrington in 1859 as a brightening around sunspots (a so-called “white light” flare). It is now known that the event was remarkable – by many measures it was one of the largest events of the past few hundred years. The flare–space weather connection was immediately apparent. The event produced a transient variation in the Earth’s magnetic field measured at ground level coincident with the flare (caused by increased ionisation in the upper atmosphere due to ultraviolet radiation from the Sun), and led to a magnetic storm with magnificent aurorae observed at low latitudes, as well as disruptions to telegraph communications for several days. Despite this, the Sun–Earth link was doubted at the time, because of the difficulty in explaining the underlying mechanisms. We now understand many of the processes that occur, and in recent decades our awareness of the vulnerability of our modern technological society to a Carrington-level event has increased. Estimates of the total cost extend to tens of billions of dollars. A particular threat is the prospect of the loss of GPS satellites given the ubiquitous use of GPS data. The solar cycle also influences the Earth’s climate. The Maunder minimum shown in Figure 1 coincided with a Little Ice Age in Europe, an extended period of colder weather. There has been considerable interest in understanding this link because of the global warming problem. 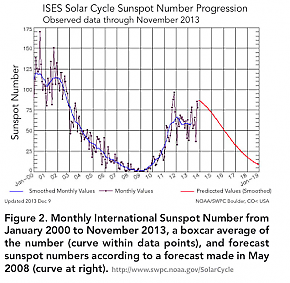 Satellite measurements show that the total solar irradiance ( i.e. the total power output of the Sun) varies by about 0.1% with the solar cycle. It is greatest at the peak of the cycle. This seems paradoxical because sunspots are relatively dark, but spots are surrounded by faculae, patches of relatively greater photospheric brightness. Simple estimates of the corresponding variations in global temperature imply that the solar cycle should have a significant (and measureable) influence on climate, but over recent decades this “solar forcing” has made a relatively small contribution to changes in climate. Some researchers have argued that there may be a more complex interplay between the Sun’s output and the Earth’s response, which might enhance solar forcing of the climate, but the evidence does not appear to support the proposed mechanisms. The consensus is that the solar cycle may contribute to climate change, but it does not account for recent global warming. The Sun will not excuse our misbehaviour!